91 kilometer from Udaipur and 162 kilometer from Jodhpur, deep in the picturesque valley on the western side of the Aravalli Hills, there is the spectacular architecturally beautiful ancient Jain Temple at Ranakpur, a town in Pali district of Rajasthan. This renowned Jain temple is dedicated to Tirthankara Rishabhanatha. Rishabhanatha, also known as Adinath, was the first Tirthankara of Jainism. The town of Ranakpur and the Ranakpur Temple are named after the provincial ruler monarch, Rana Kumbha who supported the construction of the temple complex. 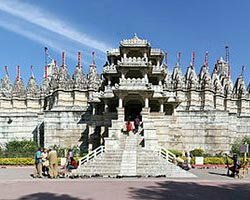 The Jain Temple at Ranakpur is also known as Chaumukha Jain Temple as it is designed as Chaumukha - with four faces. Carved exclusively with exceptional detailing out of shining white marble and delimited by lush green forest, the Ranakpur Jain Temple occupies an area of approximately 60 X 62 meters. Featuring distinctive domes, turrets, shikhara, and cupolas, the temple impressively rises from the slope of an elevated hill. The grand temple is supported by over 1444 distinctive marble pillars, carved in exquisite details. You will be amazed to know that no two pillars are the same in designs and detailing. More interesting fact is that it is impossible to count the number of the exquisitely carved pillars that support the temple. One more interesting fact is that all the statues within the temple complex face one or other statues. You will also be amazed to see a beautiful carving made out of a single marble rock where there 108 heads of snakes and many tails in the temple complex. The interesting fact about is that you cannot find the end of the tails. There is the 6 feet tall white colored idol of Adinath, which is the main statue of the temple. Ranakpur Sun Temple: There is also a Sun Temple at Ranakpur that dates back to the 13th century. After its destruction, the temple was reconstructed in the 15th century CE. Built in the classic Nagara architectural style using white lime stone, the Sun Temple at Ranakpur exhibits an excellence of intricate sculptural and architectural work. The Sun Temple at Ranakpur faces east. The architecture of the temple is extremely beautiful. There is the sanctum crowned with a beautiful shikhara and octagonal mandapa with six verandas preceding the sanctum. The exterior of the sanctum are exquisitely carved and sculpted with the images of the Sun God seated on a chariot. The octagonal mandapa is supported by brilliantly carved pillars. Exquisitely carved and sculpted torans join the columns, leading to the beautiful sanctum. Ranakpur has been one of the most sought after tourist destinations on Rajasthan tours in India because of spectacular Jain Temple and Sun Temple. Exploring these architecturally beautiful temples will provide you a pleasant tourism experience to cherish for the lifetime.